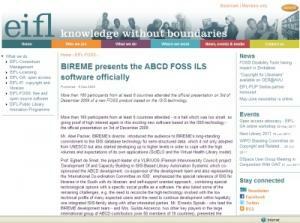 More then 160 participants from at least 6 countries attended - in a hall which was too small, so giving proof of high interest again in this exciting new software based on the ISIS-technology - the official presentation on 3rd of December 2009. An article on Sage Journals on line by Egbert de Smet, University of Antwerp. The article was published on November 1st 2009. 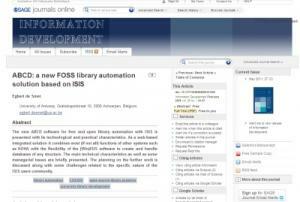 Abstract: The new ABCD software for free and open library automation with ISIS is presented with its technological and practical characteristics. As a web-based integrated solution it combines most (if not all) functions of other systems such as KOHA with the flexibility of the (Win)ISIS software to create and handle databases of any structure. The main technical characteristics as well as some managerial issues are briefly presented.